The statistic shows the distribution of the workforce across economic sectors in Japan from 2007 to 2017. In 2017, 3.49 percent of the workforce was employed in agriculture, 25.58 percent in industry and 70.93 percent in services. Japan’s economy is one of the strongest in the world, and the country’s standard of living is eminently high. Japan ranks third among the countries with the largest gross domestic product / GDP worldwide; a look at the distribution of gross domestic product / GDP across economic sectors in Japan shows that the vast majority of Japan’s GDP is generated by the services sector. 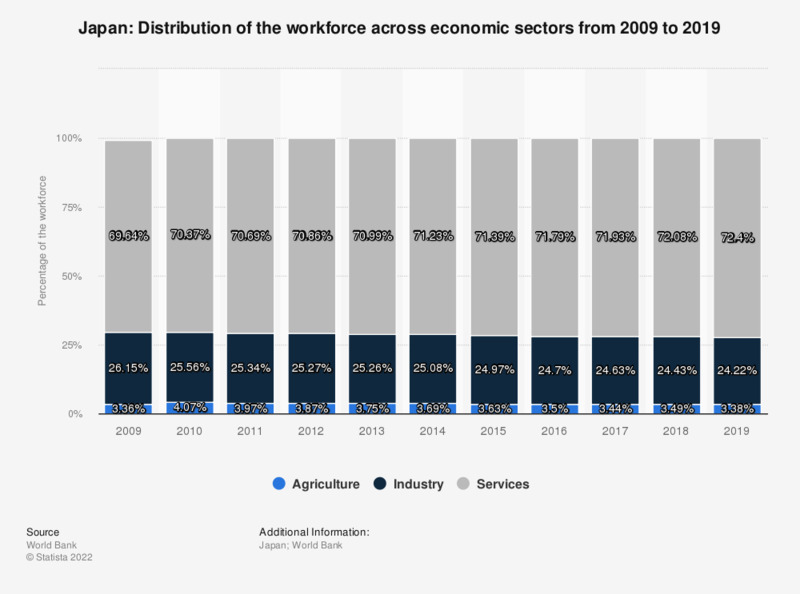 The majority of Japan’s workforce is employed in this sector, with less than a third working in industry and only a little more than 1 percent working in agriculture. Similarly to its gross domestic product, the unemployment rate in Japan has been quite steady for the past few years, and even decreased slightly. The inflation rate in Japan, on the other hand, has been fluctuating in recent years, and is currently one of the lowest worldwide. Japan is famous for a high life expectancy, and the median age (i.e. one half of the population is younger and the other half is older) of the Japanese population is thus also among the highest in the world, as can be seen in a comparison of the median age of the population of selected countries. The median age in Japan is significantly higher than in other developed countries, like France or the United States.